Marin County is a rather small slice of the northern California coast -- but what a slice it is! It includes Pt. Reyes and Bolinas Lagoon, two absolutely birding gems that together have recorded about as many bird species as any similarly sized spot in all of North America. To add to the checklist, an underwater feature called the Cordell Banks produces pelagic upwelling offshore that is nearer to the tip of Pt. Reyes than any other part of California, and therefore a host of pelagic birds found at the Banks are assigned to Marin County. Although Marin County is famed for Pt. Reyes, Bolinas, and the rarities, it also has a oak woodlands, redwood canyons, grasslands, and chaparral. Pt. Diablo, overlooking the north side of the Golden Gate and just across the bridge from San Francisco, is a world class raptor observatory in fall migration. County birding statistics and links are on Joe Morlan's site. There is an outstanding Breeding Bird Atlas (Shuford 1993) with extensive discussions of the ecology of local breeders, and an indispensable bibliography. The photo for Marin County is rather eccentric. 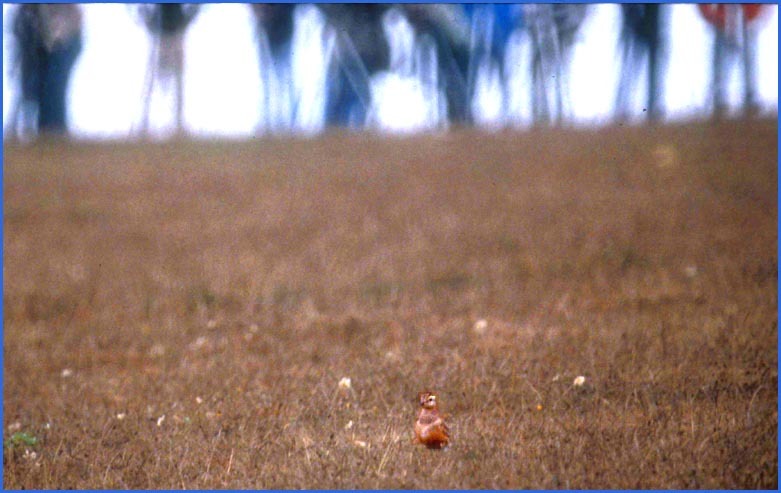 It is a long view that shows the State's first 'chaseable' Dotterel standing in the short-grass pasture with hordes of birders watching it through scopes in the background. I realize this is not a great photo but nonetheless I like the 'feeling' of the event that it presents. 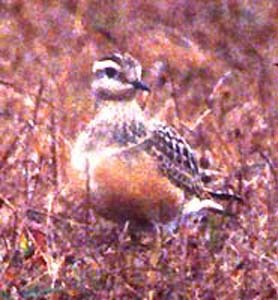 A closer shot of the Dotterel itself is below left, but it still is marginal; I did not have very good equipment back then. Searching for vagrants is the sine qua non of Marin County. When I lived in the Bay Area, I did my share on outer Pt. Reyes in spring and fall migrations. I even found the State's first mainland record of White-eyed Vireo there in June 1975. Another great vagrant spot is at the Cordell Banks, offshore Pt. Reyes. 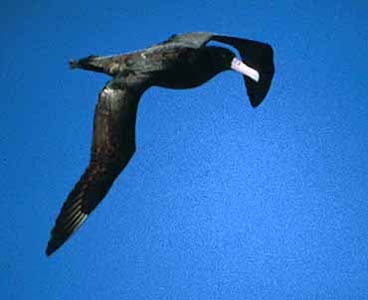 This is usually reached through pelagic trips originating in Bodega Bay. Certainly the bird that I enjoyed the most at the Cordell Bank was the young Short-tailed Albatross on 5 Nov 1985 (below right). Below are a couple of Pt. Reyes viewsheds (top two photos): south beach, facing the Pacific Ocean, and the small dairy birders call "Mendoza Ranch" with its isolated cypress trees. These attract vagrant passerines in spring and fall migration when weather conditions are favorable (both photos 27 Sep 1974). The bottom shot shows a much more inland location, Nicasio Reservoir (9 Nov 1975).